If you're planning on a little Irish fun over the weekend, make sure to sport your shades of green! No one likes to get pinched! Here are some of my favorite green pieces that are sure to bring you luck! Last Slow Dance Dress // Two Tone Ankle Strap Wedges. 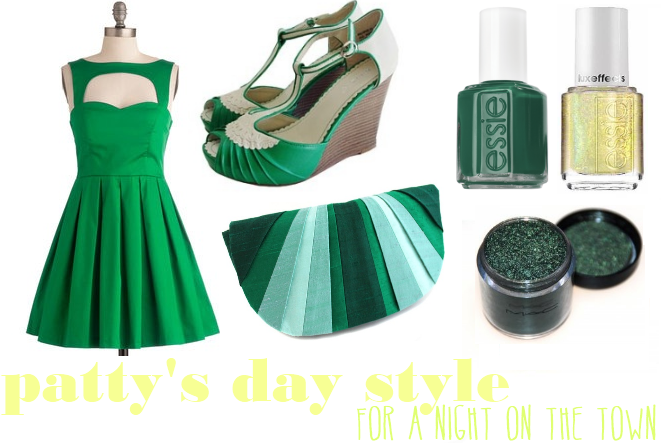 // Emerald Pleated Clutch. // Essie Nail Polish in Emerald and Shine of the Times. // M.A.C Pigment in Emerald. Have a very fun, festive holiday weekend and be safe! Ohhh, what pretty finds. And they created such a pretty collage. Those shoes are so cool. That clutch is super cool! I love it!! Great picks! I love the dress! It's so cute! Great finds! nice picks! I love the dress and those shoes! New follower from the link-up! Love your blog! Thanks for hosting! New follower via the blog hop. Super cute blog! This is all so gorgeous!